It isn’t very often that I get to review a reprint of a fishing book that was a childhood favourite; in fact it isn’t often that I get to review a reprint of a fishing book. Pike was my bible as a teenager, and anything I know about the subject can be laid at the door of the author. This book was first published when I was 11 years old and I can remember saving up to buy it. If I hadn’t given it away in a mad fit of generosity when I went to university I would be in possession of a rapidly appreciating asset, because Pike has become a collector’s item, and my copy was in mint condition, despite having been leafed through more times than I care to remember. And now my old favourite has been reissued, in a smart new limited edition hardback and all I have to say is that it is worth every single penny of the cover price. The edition is limited to 750 copies, which is about as many as you would expect a book of this type to sell over a three year period. Wives, get thee out there and buy this for your husbands, be they coarse men, carp men or fly fishermen, because this book is good for your soul and I plan to reread every single line on the cold winter nights that lie ahead. 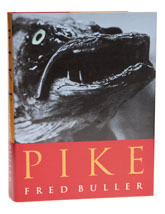 The best thing of all is that although - by definition - Pike doesn't detail the most modern methods, if you follow Fred's advice, you will still catch plenty of fish and it makes the most wonderful read. Since the review was written, this edition has gone out of print and copies have approximately doubled in price, but it is still good value, because the 1971 first edition is becoming very expensive indeed.